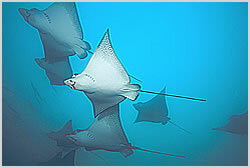 This north Bunaken Island dive site was named after the underwater photographer Mike Severns. Topography consists of a vertical amphitheatre shaped wall covered in hard and soft coral, the reef often breaks the surface at low tide. Large gorgonians and sponges can be found along with some bigger pelagics such as barracuda, eagle rays and whitetip reef sharks. The fishlife here is simply stunning. A little further east is this spot named after a Japanese dive instructor. It is very similar to Mike's Point with a spectacular coral covered wall and big pelagics including tuna, jacks and reef sharks. Sea snakes have also been spotted in this area.